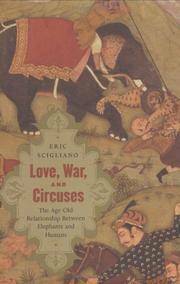 Love, War, and Circuses: the Age-Old Relationsip Between Elephants and Humans. New York: Houghton Mifflin , 2002. First Edition, First Printing 1/4 cloth AS NEW in AS NEW DJ 8vo (8vo (5-1/2 x 8-1/2), 358 pp including Notes, Bibliography, and Index. Hardbound book is FINE -- Unmarked, Unread, and AS NEW in AS NEW unclipped pictorial DJ. (h) The titles tells the general scope of the book -- the history of elephants from mammoths to creatures of worship to thunderers in wars to circuses, always a source of fascination. Thoroughly researched but engagingly and enjoyably written, this book comes as close to explaining the ways of elephants and how humans perceive them -- not necessarily the same thing -- there is an amazement and awe that is created when in the close presence of an elephant. and Mr. Scigliano understands that. 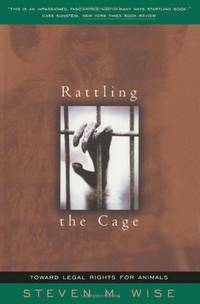 Rattling the Cage: Toward Legal Rights for Animals. By Wise, Steven M; Foreword by Jane Goodall. Cambridge: Perseus, 2000. Pictorial Wraps Near Fine in Fine wraps 8vo (6 x 9-1/4), 362 pp with extensive chapter notes and index. Trade Paperback AS NEW in pictorial wraps ... AS NEW other than remainder mark, therefore NEAR FINE Argues the case -- understood by everyone who works with apes -- that there must be legal recognition for their rights as captives in our society. Brilliant and ground-breaking. Perhaps not the final word, but this book put the issue into play, and made it necessary for demanded for society to resolve the problem.